Growing research shows that exhibiting purpose and desire to maintain homeostasis to sustain life is the most distinctive quality shared by all living things. 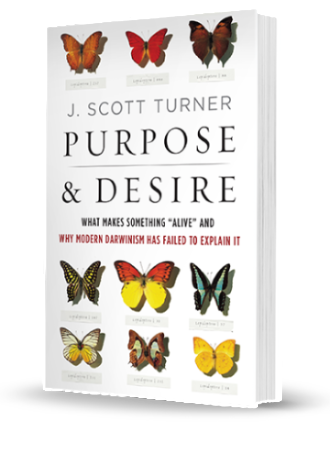 In Purpose and Desire, Scott Turner argues that modern Darwinism’s materialist and mechanistic biases have led to a scientific dead end, unable to define what life is—and only an openness to the qualities of "purpose and desire" will move the field forward. Turner draws on the work of Claude Bernard, a contemporary of Darwin revered within evolutionary circles, to build on Bernard’s "dangerous idea" of vitalism, which seeks to identify what makes "life" a unique phenomenon of nature. To further its quest to achieve a fuller understanding of life, Turner argues, science must move beyond strictly accepted measures that consider only the mechanics of nature. Dr. J. Scott Turner is a leading biologist and physiologist and professor of biology at the State University of New York College of Environmental Science and Forestry, in Syracuse, New York. His work has garnered attention in the New York Times Book Review, Science, Nature, American Scientist, National Geographic Online, NPR “Science Friday” and other leading media outlets. He is the author of two books with Harvard University Press: The Extended Organism: The Physiology of Animal Built Structures(2000) and The Tinkerer’s Accomplice: How Design Emerges from Life Itself (2007). Visit him at jscottturner.com.